Greetings again from the darkness. 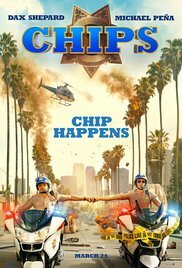 In a Hollywood self-congratulatory world that considers sequels, reboots and remakes as creative projects; and imitation as the most sincere form of flattery … not to mention the safest hedged bet … it’s not in the least surprising that we now have a film version of “CHiPs”, a lightweight and popular TV show that ran from 1977 through 1983. What should be surprising is that a studio entrusted Dax Shepard with the ultimate slash role of Director/Writer/Producer/Actor for this contemporary version. Of course, as with film versions of “21 Jump Street” and “Starsky and Hutch”, the target audience isn’t really those who watched the original TV series, but rather the group of big-spending millennials who seem to thrive on raunchy humor, while placing minimal value on a coherent or interesting story. Buddy cop films that blend tense drama, wise-cracking partners and eye-widening action have long been popular, with the jewel of the genre being Lethal Weapon. This latest entry does nothing to threaten the now 30 year reign of Mel Gibson and Danny Glover. Dax Shepard stars in his own film as Jon Baker, now reinvented as a former X-games motorcycle champ who is attempting to save his long-fizzled marriage by becoming a cop. The rookie’s partner is undercover FBI Agent Frank “Ponch” Poncherello played by Michael Pena. Each has their own personal issues: Jon is addicted to prescription painkillers, and Ponch struggles to control certain urges … and unfortunately for viewers, the two spend an inordinate amount of time discussing these issues. The crime wave they are attempting to bust involves a corrupt cop. Seeing that Vincent D’Onofrio is in the cast immediately takes away any mystery about the bad guy’s identity, but were there any doubt, the film exposes him in the first action sequence. After that comes the onslaught of verbal sparring, explosions, gunplay and one especially gory moment. With Dax Shepard at the helm, we understand going in that the raunchy humor faucet will be fully open. Topics covered in one-liners, gags and recurring themes include: homophobia, sexting, masturbating, bowel movements, marriage therapy, d**k jokes, prescription drugs, paparazzi, and yoga pants. But seriously, how many “eating a**” jokes does one movie need? It’s a topic that goes from uncomfortable to unnecessary pretty quickly. Cars and bikes are vital here, though it seems that the motorcycle stunts could have been jazzed up a bit, and we certainly expected more cameos than the mandatory one near the end. The original series thrived on being ‘tongue in cheek’, and Mr. Shepard’s version brings new meaning to the phrase. The opening credits state “The California Highway Patrol does not endorse this film. At all.” It’s an understandable stance. Greetings again from the darkness. From rags to riches … a common expression that often leads to a paint-by-numbers movie. Co-directors Jeff Zimbalist and Michael Zimbalist are fortunate in that their “coming of age” subject is the globally famous Pele’ – often considered the greatest soccer/futbol player of all-time. 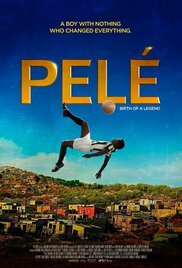 Rather than revisit the career of the transcendent player who later dedicated his life to humanitarian causes, the film kicks off with a 17 year old Pele trotting out onto the pitch at the 1958 World Cup. It then flashes back 8 years to when 9 year old “Dico” was growing up in the slums of Sao Paulo. We get to see his relationship with his family … his dad taught him to play, and his friends were loyal to him and encouraged him to pursue his dream. There are some similarities to The Sandlot as we watch the joy these boys have in playing the sport whenever and wherever they can … plus the origin of the somewhat derogatory and now immortal nickname. It seemed that Pele’ was able to carry this love of the game throughout his career. We see boys huddled around a radio listening to the 1950 World Cup as Brazil’s team was humiliated … an event that played a role in Pele’ returning pride to a bruised country. Kevin de Paula plays Pele’ as he works his way up through the age groups and national teams. Often the youngest and shortest player, the film depicts him as a shy kid often out of his element … the polar opposite to the beaming superstar we so often saw later in his career. There is an explanation of the roots of the “Ginga” style and its ties to the Brazilian culture and martial arts. For some reason, Vincent D’Onofrio is cast as Brazil’s Coach Feola and we are forced to endure a tortuous accent that is basically inexcusable these days. There are also some exaggerations in the crowd scenes and shots of the press, though young de Paula underplays the lead. Colm Meaney plays George Raynor, the coach of Sweden in that infamous 1958 World Cup, and we do get a cute little cameo from Pele’ himself. The film does a nice job with the young man’s childhood and progression towards superstar (the IOC named him the athlete of the century). He is presented as close to his family, and inherently quiet and calm. The match clips of Pele’ that play over the closing credits are proof that a movie just can’t capture the transcendence of his talent. Pele’ is truly the reason it’s “the beautiful game”. Greetings again from the darkness. The old adage “blood is thicker than water” has always been fruitful movie fodder. 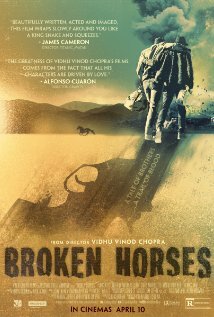 Writer/director Vidhu Vinod Chopra takes the theme to a small, dusty town on the Mexico border. He introduces us to the sons of the local sheriff … Buddy is the slow-witted eldest and Jakey the bespectacled musical prodigy. Buddy is flashing his dead-eye aim at the shooting range when his father (Thomas Jane) is murdered right in front of him. Local mobster Mr. Hench (Vincent D’Onofrio) seizes the opportunity to utilize young Buddy’s need for revenge. Jump ahead 15 years, and Jakey (Anton Yelchen, Star Trek) is engaged to Vittoria (Maria Valverde) and living in New York City as a classical violinist. Things get interesting when Buddy (Chris Marquette) entices Jakey to come visit after being away for eight years. Jake isn’t in town very long before he fully understands that Hench has a grip on Buddy, who is now a full-fledged hitman (in a Rainman kind of way) engulfed in the various border gang wars. Here is where the brotherly bond kicks in. 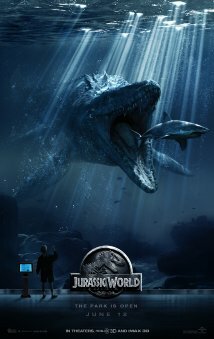 Watching it play out against the manipulative power of Hench provides the meatiest conflict within the film. The brothers admit to living on “different planets”, but it’s clear that their traumatic childhood has connected them in a manner that time and distance can’t break … even though one of them more readily identifies “bad men”. Sean Patrick Flanery (Boondock Saints) has an odd, but hyper-energetic small role, but most of the screen time is taken by D’Onofrio, Yelchin and Marquette. A better written role for Ms. Valverde would have been advantageous, but mostly this is a solid little crime drama with an emphasis on brotherly bond. Greetings again from the darkness. Imagine if Liam Neeson’s burned out Air Marshall from Non-Stop was instead a one-time mob hit man who had seen better days. That seems to be the inspiration for director Jaume Collet-Serra’s film (yes, he directed Non-Stop as well). When a guy is a drunken mess with no family who speak to him and only one friend – his old mob boss – a nickname like The Gravedigger tends to conjure better days of yore. 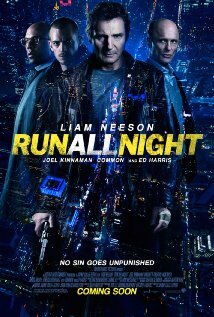 Neeson plays Jimmy Conlon, the has-been hitman whose only remaining friend is boss Shawn Maguire (Ed Harris). These days, Conlon expends more effort emptying a glass than fulfilling a contract. Shawn respects their history and does all he can to protect his long-time friend who seems intent on boozing himself to death. As is customary in these “crime doesn’t pay” films, things get really messed up in the blink of an eye. 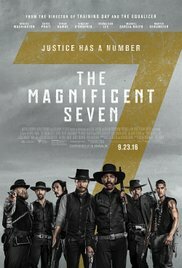 Thanks to a wrong place at the wrong time moment, Conlon protects his own son (Joel Kinnaman) by shooting Maguire’s misguided son (Boyd Holbrook). Thus endeth the friendship. The script is from Brad Ingelsby who wrote the original script for Out of the Furnace (2013), but most of it is pretty predictable. Still, with an excellent cast and some wildly creative camera work from cinematographer Martin Ruhe (Harry Brown, The American), this one offers plenty on the entertainment scale. The restaurant scene where Harris and Neeson face off is alone worth the price of admission. Mr. Collet-Serra has directed Unknown and Non-Stop, so Neeson is quite comfortable working with him, and you should certainly know what to expect going in. The friendship between two mobsters ends the way most do, and it’s another take on the blood family vs mob family loyalties. The Gravedigger may have one foot in his own grave, but he also has enough left for one wild night. Greetings again from the darkness. It’s hard to beat a good on screen courtroom drama for tension and conflict. Despite centering around a long time judge accused of manslaughter and being defended by his estranged son, a hotshot defense attorney, this one eschews gritty courtroom action in favor of uncomfortable and explosive family dynamics. And thanks to the acting abilities of Robert Duvall and Robert Downey Jr, that’s a good thing. 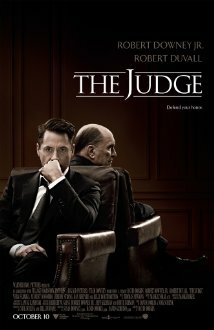 Mr. Downey’s Iron Man/Tony Stark character has ingrained in movie goers his motor-mouthed smart-aleck persona that fits very well with the lacking-a-conscience cocky defense attorney who only defends the type of white collar criminals who can afford his unmatched courtroom savvy. When Hank (Downey) returns home for the funeral of his mother, we quickly witness the strained relationship with his demanding-perfection magistrate father (Duvall), and the historical family details slow-drip for the next couple of hours. Hank’s older brother (Vincent D’Onofrio) was once a promising baseball player whose career was cut short after an automobile accident (with a crucial component). Hank’s younger brother (Jeremy Strong, who played Lee Harvey Oswald in Parkland) is a mentally handicapped young man attached to his video camera. Hank also (of course) runs into his high school sweetheart (Vera Farmiga) and her daughter (Leighton Meester), as a reminder of what he left behind in his quaint hometown when he chose fortune and big city life. John Grisham has made a career, actually two (books and movies), dissecting lawyers and courtrooms. As you might imagine, director David Dobkin (Wedding Crashers, Fred Claus) doesn’t have Grisham’s eye and ear for the courtroom, so the script often slips into manipulative melodrama during the trial (think Grisham-lite). But the scenes between Duvall and Downey more than make up for the fluffy parts. The kitchen confrontation and the bathroom sequence couldn’t be any more different, or any more powerful. One is the exorcism of a parent-child relationship gone bad, and the other is a vivid depiction of old age and disease. This is old-fashioned mainstream movie-making. It’s about relationships and family and personality and life choices. There are no explosions or CGI or car chases. Even the key crime happens off screen. It’s also not breaking any new ground, and if not for the acting, could be just another TV movie. A perfect example is Vera Farmiga, who brings an edge to a role that otherwise would be superfluous. Same with Hank’s brothers. Both roles are severely underwritten, but D’Onofrio and Strong somehow make them work. Billy Bob Thornton brings a presence to an otherwise not-believable role as a slick special prosecutor wearing $1000 suits. Even Dax Shepard plays his comic relief country-bumpkin attorney slash furniture re-seller in an understated (for him) manner. Other support work is provided by Ken Howard as the judge, Emma Trembley (Hank’s daughter), Balthazar Getty as the deputy with a grudge, Grace Zabriske as the victim’s vengeance seeking mother, David Krumholtz as a District Attorney, and Denis O’Hare as Duvall’s doctor. In better hands, the script could have become much sharper and the film much crisper. Prepare for cheese and schmaltz, but it’s difficult to imagine more fun than watching Duvall and Downey go nose to nose and toe to toe. If you stay for closing credits, you’ll hear Willie Nelson wobbly warble through a Coldplay song.